Debunking the Science of House, M.D. 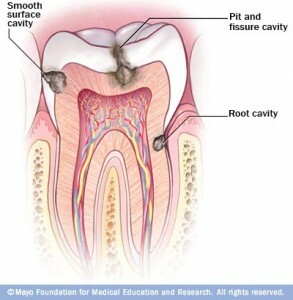 There are a variety of dental caries that can be caused by glucansucrase. Photo courtesy of the Mayo Foundation for Medical Education. After all of those dentist visits, is it finally time to say good-bye to tooth decay? Dental caries, more commonly known as tooth decay, may be rendered more preventable in the near future due to an exciting breakthrough. Researchers from the University of Groningen have recently uncovered the structure and mechanism of the glucansucrase enzyme that allows dental plaque to stick to your teeth, leading to their decay. Armed with this discovery and strategies for combating this enzyme, tooth decay may become a thing of the past. According to the American Dental Association, caries are defined as the “destruction of the tooth enamel.” When residue from carbohydrate-rich foods such as bread, flavored beverages, or sweets, sticks to teeth, bacteria can then attach and start the degradation process. This condition is so prevalent that 92% of adults between the ages of 20 to 64 have had tooth decay in their permanent teeth, and 23% of adults between the ages of 20 to 64 have untreated decay, based on studies by the National Institute of Dental and Craniofacial Research. When left untreated, the disease can lead to pain, infection, and tooth loss. Despite modern preventive techniques such as brushing with fluoride toothpaste and flossing, tooth decay is still a common occurrence. Fluoride basically works by strengthening tooth enamel, but this technique does not get rid of the problem. Furthermore, there are uncontrollable factors such as the bacterial interactions, tooth structure, and salivary flow that can cause fluoride to be ineffective. Thus, the only definitive protection from tooth decay is to prevent bacteria from attaching to the teeth. University of Groningen professors Bauke Dijkstra and Lubbert Dijkhuizen analyzed glucansucrase from the lactic acid bacterium Lactobacillus reuteri, which uses the enzyme to convert sucrose from food into carbohydrates that allow them to attach themselves to the tooth enamel. Bacteria similar to Lactobacillus reuteri are the main cause of tooth decay and utilize this same enzyme to attach to tooth enamel. This crucial step of attachment allows the bacteria position themselves to release acids and break down the calcium in teeth, thus causing caries. These glucansucrase enzymes from the glycoside hydrolase 70 family (GH70) are large multi-domain proteins of glycoside hydrolase that occur exclusively in lactic acid bacteria. Glucansucrase proteins likely evolved from the digestive amylase enzymes that degrade starch. They catalyze the synthesis of long sugar chains, called α-glucans, without needing nucleotide activated sugars or cofactors. Despite the first glucansucrase-encoding gene being sequenced more than 20 years ago, the three-dimensional structure of glucansucrases could not be determined, and thus scientists were unable to clearly identify those features of the glucansucrase structure that determine function. Recently, protein crystallography was used to obtain the first successful glucansucrase crystal structure. From this structure, the Groningen researchers were able to elucidate not only the unique folding mechanism of the protein, but also determined the active site of the enzyme. It has been shown that these two activities actually occur in the same active site, with the cavity in which the glucose moiety of sucrose binds being highly conserved across all lactic acid bacteria. Thus, the new proposed structure by these researchers shows that glucansucrase’s structure folds into a “U” shape. A recent discovery led to the elucidation of the structure of glucansucrase. Photo courtesy of Microbiology and Molecular Biology Reviews. To combat tooth decay, researchers are currently looking for inhibitors of this active site on the glucansucrase enzyme. By inhibiting this active site, bacteria will no longer be able to attach to tooth enamel and therefore will not be able to release the acids that dissolve the calcium in teeth either. Consequently, glucansucrases are a potent target for anti-cavity drugs. However, because the crystal structure demonstrates that glucansucrase has nearly the same β/α-barrel active sites as the essential digestive protein amylase, no current inhibitors exist that are specific enough to target only glucansucrase. It thus may be necessary for glucansucrase inhibitors to exploit unique features of the glucansucrase enzyme farther away from the active site. Dijkhuizen notes that once an appropriate glucansucrase inhibitor has been found, it can be added to toothpaste, just like how fluoride is now included in our current toothpaste. In addition, it could potentially be added to food containing high amounts of sugar so that the glucansucrase inhibitor can function during eating. These innovative approaches may spell the end of dental caries, and with them, the end of discomfort and tooth loss associated with tooth decay.